Someone once said, “wisdom is always chasing us...but we are faster.” It’s true that time moves incredibly fast at Augustana, but what we do in that time is incredibly worthwhile, fun, and life changing. Perhaps like some of you, I came to college knowing what I would major in. While Government and International Relations is still my primary focus, I have also picked up minors in Political Philosophy and Classics. For those of you who don’t know what direction you’re headed, Augustana will teach you to think critically, express yourself clearly, and understand complex issues from different angles. My classmates in all majors and minors will leave here well-equipped for a world that needs more open-minded, critical thinkers. As soon as you get to campus, conversations begin about sending you away. Each year, our students study in over 20 countries during the summer, spring break, January interim, and fall and spring semesters. So far, I’ve been able to study ancient history in Greece and London, religion and literature in India, and peace and conflict in Norway. This year, I’m looking forward to spending J-term in Thailand studying the country’s political economy. 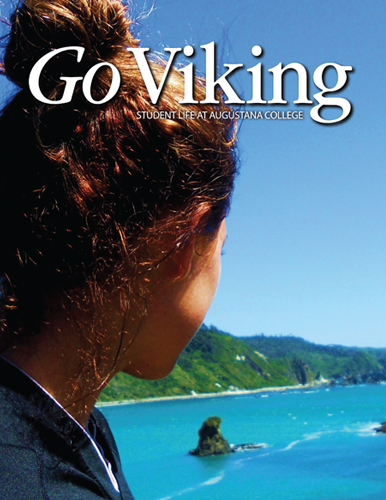 At Augustana, the world is at your fingertips. The annual Boe Forum on Public Affairs brings in speakers such as former Secretary of State Madeleine Albright. Each spring, Augustana and four of its sister schools host the Nobel Peace Prize Forum which features Peace Prize Laureates and other peace activists from around the globe. The Union Board of Governors (UBG) is run by students and puts on more than 90 events each school year with at least one event each weekend – and our students stick around on weekends. UBG is just one of 97 student organizations; there’s something for everyone. Augustana’s athletic teams are nationally competitive and our sports facilities bring home games to campus with a loud and rowdy student section cheering on our teams. Ask a current student or Augustana graduate what their favorite part of the College is. Most will say “the community,” but then struggle when they try to explain what this means. It’s true that only by being here can you really understand the fast-paced, friendly atmosphere. For me, Augustana’s community is about the quality of people you’ll find here – people who are curious, open-minded, unpretentious and motivated. Dr. Stanichar, associate professor of music, has a sign in his office that says, “Enjoy life – this is not a rehearsal!” Instead of waiting to join the “real world” after graduation, Augustana students live active and meaningful lives now. They begin medical partnerships with small towns in Guatemala; they raise awareness about important issues, such as human trafficking; they contribute to academic conferences in the U.S. and around the world; they intern with local businesses and healthcare providers; they conduct important research recognized by scholars around the country; they volunteer for dozens of local causes. Here, opportunities abound and our students flourish. Whether your future is guided by a definite calling or an uncertain plan, your time at Augustana will prepare you for whatever lies ahead. Equally as important, you’ll create some of the best memories of your life with friends you meet here! As President Oliver says, “It’s a great day to be a Viking.” And, it’s a great time for you to Go Viking!